I had always been fascinated with Chrysler products. My father drove Dodges, Plymouths and Chryslers all his life. The owner of the company he worked for drove Imperial's. His were the only Imperials in our town so they stood out. I loved the fins. My favourite of the early Chryslers were the 62's, they were so clean. As my “car nut” life started to unfold in the late 60's I began to understand and appreciate what the 300's meant in the Chrysler line up. The letter cars did not register, as there were none ever sold new in our province. I followed the muscle car route as I got my licence and have owned just about every make from 1966 to 1977. The site of an Early Chrysler always turned my head. 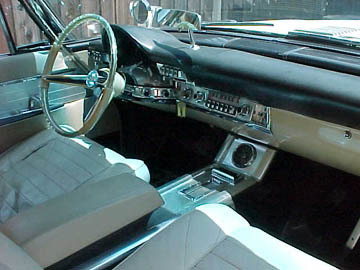 While attending swap meets between 1982 and the late 90's I always looked at the 58-63 Imperials with the thought of buying one. I already owner several 70's muscle cars and thought the Imperial would make a nice addition albeit different. I bought every book written about the Chryslers of the Forward Look and was becoming enthralled with the letter cars. The hook was what I had read about the 300F 4 speed cars. The 300F was now the only Chrysler I lusted about. While travelling through Texas in March of 2000 with my son, we attended an auction near San Antonio. The purpose of the trip had been a Golf junket during spring break and the auction fit in just nicely. While there were no interesting Chryslers at the auction a discussion with my son about my “collector car wish list” ensued. Kids ask the neatest questions! I included the four cars I currently had (Two Oldsmobile's, a Mercedes and a 68 Dodge Charger). The list was 12 cars and a white 1960 300F was a priority. I had always looked at the Chrysler section of Hemmings and did so with the April and May issues. To my delight the May issue had a description of “a solid #3 300F “ in San Jose CA. A series of phone calls, photos and emails and a collapsed deal from another suitor brought me to make a decision in July 2000. I had told my wife about the plan and when I showed her a picture of the 300F and my desire to buy it she became excited about this car like no other car I had ever owned. My business travels regularly take me to the Bay area so I planned a trip for July 12 to meet with a few manufactures and look at the car while I was there. The decision was an easy one. The car was an all-original time capsule that had spent all its life in the dry rust free part of central Oregon. A deal was made and shipping was arranged for late August. Shortly after purchasing my 300F I began the quest to track its history. The person whom I bought it from only knew about the four previous years of ownership. Among the documents with the car was some correspondence from the 300 club about the car being registered in the clubs database. A pair of Oregon Plates with expiry tags of 1979 were in the trunk. I was not certain if these plates with the number AY 1887 had any relevance to my car. The correspondence started with references to Ken Diehl of Oregon. I found Kens phone number and contacted him. This was a good contact as Ken was able to fill me in on the history from 1975 to about 1997. I then contacted George Merrick whom Ken referred me to. As George was the owner from 1975, he was able to fill me in on how he bought the car in Grants Pass around 1975. George did not recall the name of the person who he bought the car from. I then requested the microfilm information from Gil Cunningham. That's when my luck started to turn. Gil's records showed the selling dealer in Salem Oregon was still in business albeit under new management. On an otherwise slow day in March 2001 I made the first of about 40 phone calls to trace my car. I first contacted David Withnall of Withnall Dodge. David was sympathetic to my request but stated his dealer records did not go back that far and as his father took over from Teague Motors in 1974 they surely had nothing prior to that. My next series of phone calls were to various club members in and around the Salem area to determine if there was any recollection of the car from new. NO Luck! About a dozen phone calls were made to title searching companies in the hope they could do a vehicle search. Still no luck. The remaining calls were made over the next two days to various contacts. In desperation I called the DMV back to see under what circumstances they did release info and to whom. I was informed that only official agencies could request such info. Agencies such as lawyers, insurance companies, police and CAR DEALERS!!. I called Withell Dodge again looking for David Withnell and spoke to his secretary. This is when I hit the mother lode. She referred me to Jan Landers who did title searches and transfers for all of the Withnell dealers. I explained my request to Jan who replied, “ No problem, my husband is a car collector and I do an occasional search for him. I know exactly what you are looking for”. I gave Jan the serial number and description of the car and she informed me it would take a few days to get the info back. I also mentioned I had license plated from 1979 but did not know if it was relevant to the car. At this point I had no idea how much, if any, info I would get. I called Jan a few days later and she confirmed she had the info back and it contained photocopies of 4 Oregon titles including the original title from February 1960. The original title showed the first plate on the car as AY 1887. Pay dirt!!. I had the packaged couriered to me and when it arrived the next day I was in heaven as I poured over the data. With info on the first owners I used the Internet People Finder to see if there was any hope of finding a relative of Lawrence and Eleanor Pohl. I found an E.R Pohl in Salem and made the call. Now What I was about to ask someone I never met, and uncertain as to how they would react to someone intruding about their privacy, left me choosing my words carefully. Say the wrong thing and get nothing! “Mrs. Pohl, My name is Paul Martin and I am a collector of vintage automobiles. I am calling about a 1960 Chrysler that I recently purchased that I believe was owned by yourself and your husband. “ (I did not know his state of health but as that there was no phone listing for him, my best assumption was that he had passed away). Needless to say I was elated, she remember the car. Not wanting to press my luck I explained myself further, apologized for any intrusion and assured her that I would follow with a letter with specific questions. To my delight she was quite chatty and recalled their ownership of the car with much detail. She confirmed her husband Larry has passed away about 6 years before. After our conversation I composed a letter with specific questions requested photos if any and included a picture of the car with my wife and I in it and our two dogs. I received a brief letter about week later explaining she had gone through some 35mm slides from the early 60's and was having them made into prints. About two weeks after that her second letter arrived with 6 prints from 1960 to 1963 showing various family trips with the car. 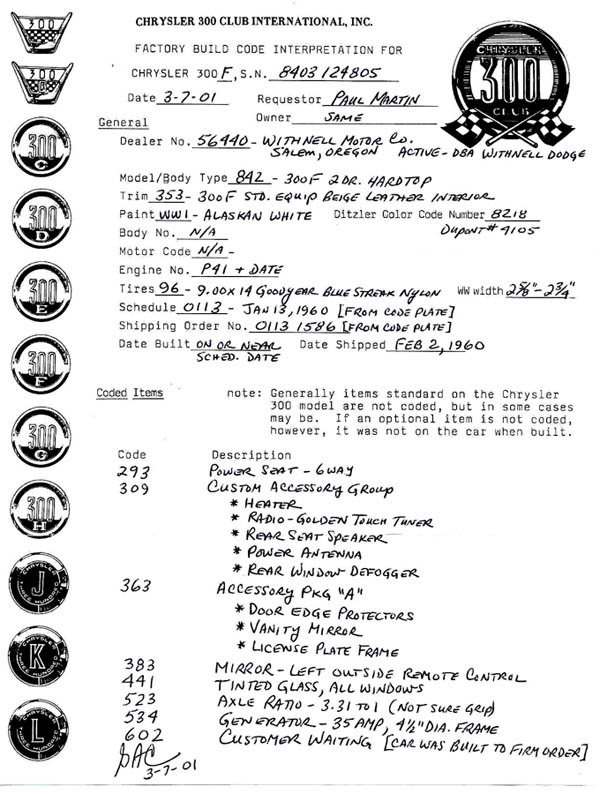 He letter stated she enjoyed the trip down memory lane looking at the photos and had received encouragement from her children as her daughter knew how important it was for a “car guy” to obtain this information. I was able to put together a nice file with the photos, registrations and the correspondence I had received about the car. Locating any original car is a major find in the old car hobby. Having the paperwork and piecing the history together is the biggest bonus of all. The hunt for the history was more exciting than buying the car itself. Once I had all the info I was sad the quest had ended. From Mrs Pohl's letter and conversations with her I pieced together the following history of ownership. Lawrence Pohl was a plastering and lathing contractor in Salem Oregon. In the fall of 1959 he was in the market for a special car and was impressed by the Chrysler 300. According to his wife Eleanor he considered many cars but was smitten with the styling and performance of the 300F. 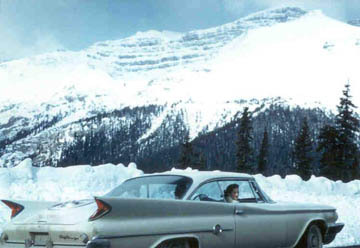 Although the car was not slated for production until January of 1960 he placed an order with Teague Motor Company in December of 1959. 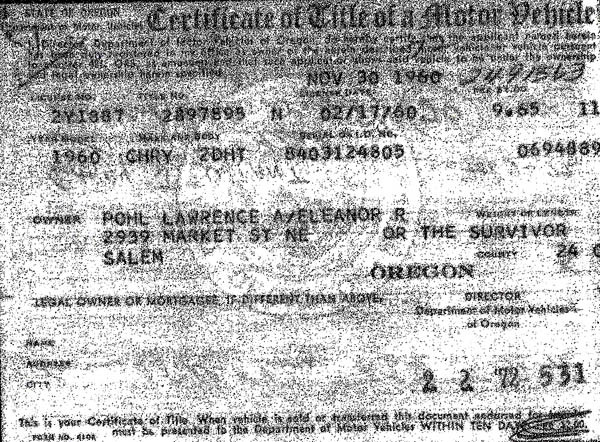 The car was delivered to its new owners on Feb 17th 1960 and was issued Oregon plate AY 1887. In April 1960 the Pohl's and two friends departed for Vancouver for a trades conference that Larry was attending. After the conference they drove to Banff Alberta for a vacation. The Pohls had three children who compromised in sharing the two rear bucket seats and promised not to complain. This arrangement lasted a few years when the family bought a station wagon for practical use. The Chrysler continued to be used for family trips particularly fishing trips to Newport Oregon, towing the 22-ft boat. Larry kept the car until 1972 when he sold it to a friend Gary Waint of Grants Pass. The car had accumulated 92,000 miles by the time Larry sold it. Waint was also a lathing contractor and kept the car until 1975. The next owner was George Merrick of Bend Oregon. George never titled the car as he kept it in storage during the first three years he owned the car. George sold the car to friend Ken Diehl in 1978. Ken titled the car and drove it occasionally during the two years he owned it. During his ownership he rebuilt the transmission, but did no other major repairs. By prior arrangement Ken sold the car back to George Merrick in 1979 and George again put the car back in storage where it remained until 1997. The next owners were Richard Palmer and Henry Hopkins of Berkley CA. During their 4 years of ownership they did much maintenance work, detailed the exterior and interior and installed new tires. With the opportunity to buy a 300F convertible they sold the car to Ken Zander of San Jose CA in Sept 1999. I had the car shipped from San Jose to Blaine WA. Work that has been completed on the car since its arrival in BC includes complete new brakes and full exhaust. A new radiator and all belts and hoses have been replaced, but other than that everything you see here is as it left the factory in January 1960.